The English Oxford Dictionary properly credits Dr. George Weinberg for coining the word "homophobia." Among the very first heterosexually-inclined mental health professionals to stand up for gay/lesbian civil rights, Dr. Weinberg is the author of many books, including the groundbreaking Society and the Healthy Homosexual. His reflections on Oscar Wilde are a GayToday exclusive. In 1900 Oscar Wilde died poverty-stricken and in exile, in a cheap hotel in Paris, with his first lover and dear friend Robert Ross at his side. "Robbie," he said at the end, "I'm dying beyond my means." A little later, gazing from his bed at the horrid wallpaper, Wilde commented, "One of us has to go," and two days later he died. Within a decade, he was more famous than ever, and his reputation has, of course, continued to grow. The truths of his insights, and the snap of their phrasing which injects them deep into the memory, are indisputable. "The tragedy of old age is not that we are old," he wrote " but that we are still young." He has forever enriched all of us with his plays, poems and stories. Apart from the gift of his genius, of his enlightenment, Wilde's life, and those of the lesser figures around him, becomes an ever enlarging puzzle as we study it. These last few years have seen a burst of expositions on Wilde. His plays are done regularly; the British movie, Wilde; the play Judas Kiss, which had a limited run on Broadwa; and the masterpiece Gross Indecency with its smash hits in New York and now its road companies, testify to the fascination that Wilde has for us—for gays and heteros alike. There were three trials of Oscar Wilde. In the first he brought suit against Lord Douglas for accusing him of "posing as a somdomite." Wilde and his friends laughed at the misspelling of sodomite, but Wilde lost that suit when Douglas produced ample evidence of his charge. To me, a fascinating and miraculous side-feature of Wilde's life was the progress (or, more technically, retrogress) of his young lover, Alfred Douglas, whose father went berserk at the idea of Wilde "buggering his son." Young Alfred begged Wilde to fight the case against his father while everyone else, knowing that it was a hopeless cause and would ruin Wilde, begged him to give it up. Alfred, a very good poet, gave us the phrase "The Love that Dare Not Speak Its Name" in a wonderful sonnet. Douglas sounded like a real gay libber, who wanted Oscar to stand up for homosexuals, whatever the cost—and the cost would have been life imprisonment. Douglas left the country during the trial, though he rejoined Wilde after his release, finally walking out when his mother promised him a stipend to do so. Fascinating was the conversion of Douglas. 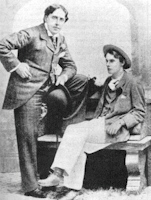 After Wilde's death he married and became violently homophobic. In 1914 Douglas accused the ever-loyal Robert Ross of being a "filthy bugger" and a "notorious sodomite," and sought to destroy him in a legal trial, just as the father whom he hated had succeeded in destroying Wilde. Ross survived but died soon afterwards, and years later his ashes were buried next to his beloved friend's. I've been studying homophobia all my life—and this is one of the great great instances of it in a homosexual person. The causes for such a conversion are hard to identify. But I don't think that any homosexual man or woman who develops homophobia in later life can manage the conversion without murderous vehemence. Such vehemence is always needed to sustain a life-lie. Douglas must have envied Ross's sexual escapades as he imagined them. Douglas, desperately needing money and marrying for it, paid the extreme price, that of having to live with rancor in his heart. The Wilde story would remain a fascination were he not a consummate genius. Though he was fond of saying that his life was his art, nothing could be further from the truth. His art was his art, and anyone with gratitude for his bequests can only wish that he had taken better care of himself. But as with any genius, who knows but that his carelessness, even what seems to us like a lack of judgment which destroyed him, was essential to his capacity to have given us so much.